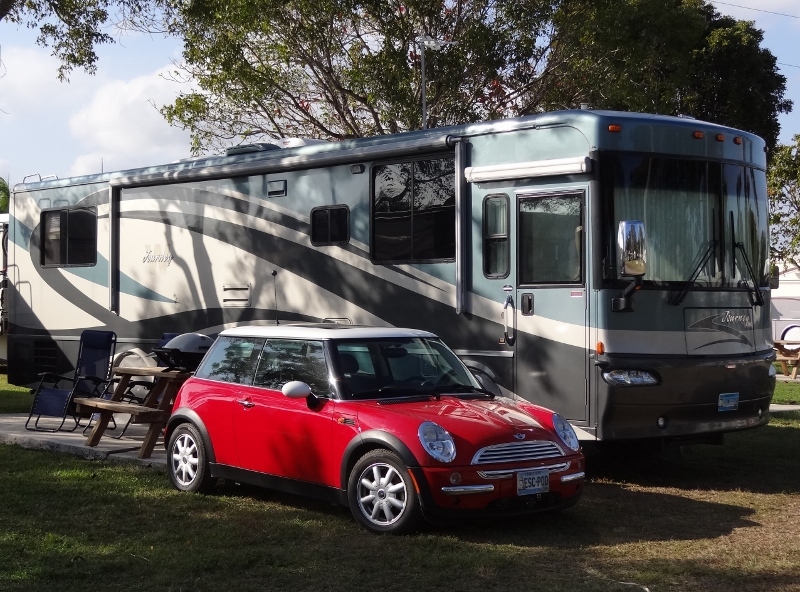 We began our winter with a couple of woodsy KOA stays, a parking lot with shrubs RV resort (you can call yourself a resort if you offer a pool), two Florida state parks, a trailer park with mobile homes and RV sites in Sanibel, then coming to rest at Venture Out Resort on Cudjoe Key for 41 nights. 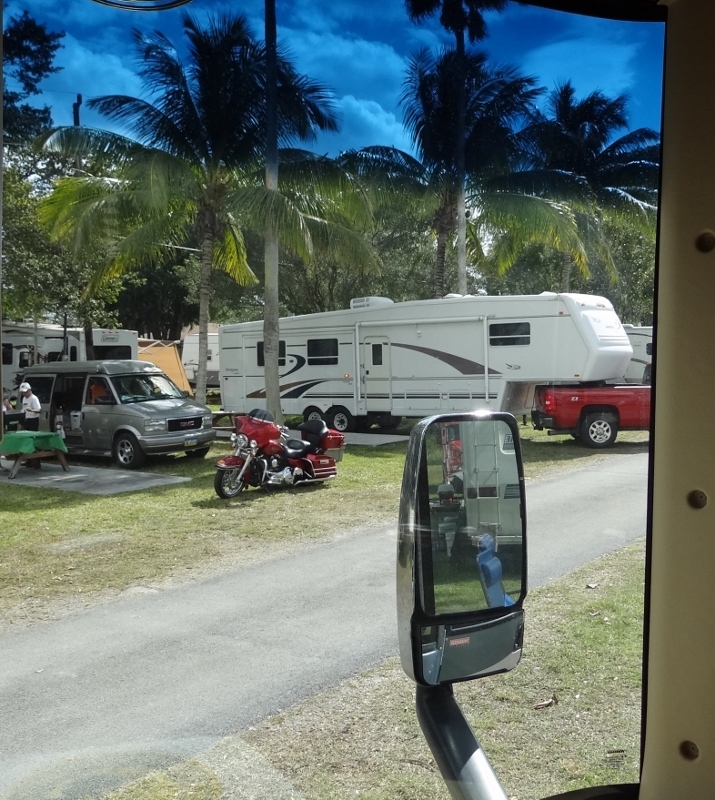 We’ll spend two weeks (1/31- 2/14) here at Southern Comfort RV Resort which gets about 6 out of 10 stars from me. 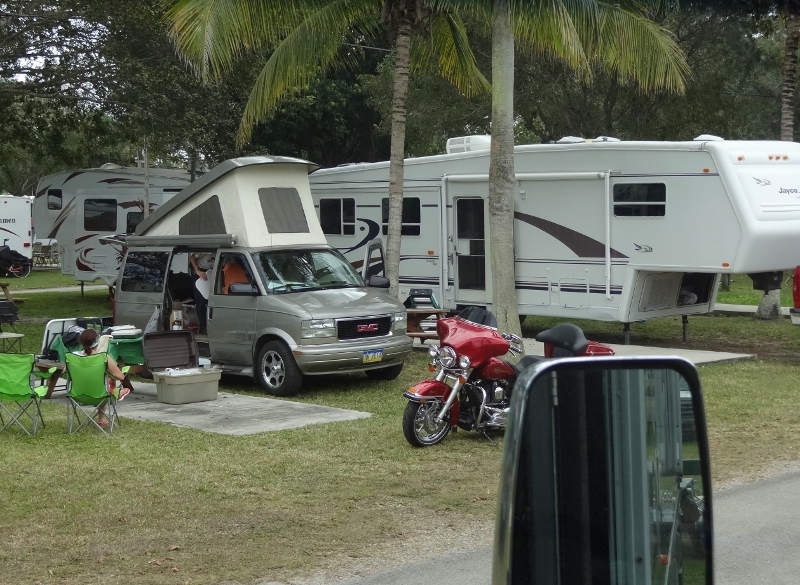 It’s more like an average regular private campground in Florida, with a budget friendly nightly cost far less than a resort in the Keys. We like the state parks best and campgrounds with a similar vibe and access to biking and walking trails. SoCo is more campground and not so much resort with grass in lieu of concrete as at Venture Out. This sounds nice at first until you discover way more ants and whatever bit the top of my foot leaving it swollen, itchy and feeling like it had been stomped on. 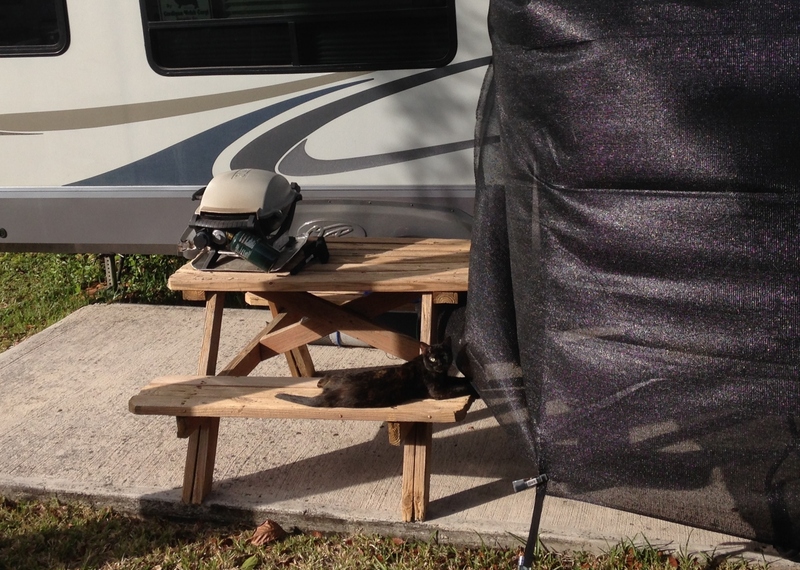 Sites are close and this makes for terrific people, camper, dog and cat watching. Dogs up to 40 lbs at maturity are allowed (but not enforced), no aggressive breeds and please clean up after. What I thought was our neighbor’s cat turned out to be one of four SoCo strays that hang around. So who’s cleaning up after the cats? No one, so watch where you step if you weren’t doing so already. Day one I went barefoot until Russ had to clean off his shoes, then switched from flip-flops to topsiders after getting bit. 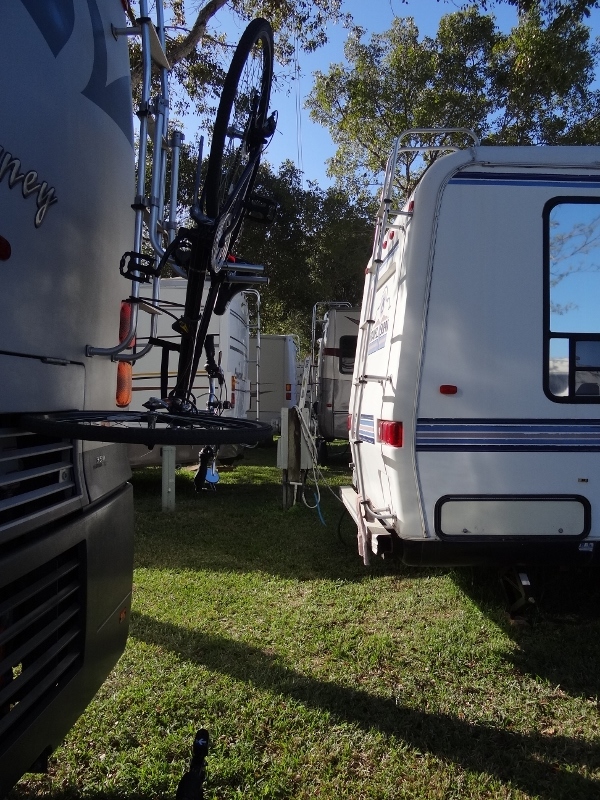 We’ve seen RVs come and go but the majority are here for the 3 or 4 winter months. Not overly friendly nor unfriendly, many with dogs, many smokers and a 60/40 mix of Class A motorhomes and 5th wheels/travel trailers with a few tents and tiny campers tossed in. We spent a few days being amazed by the tiny camper that arrived the day after us. I was taking a rare sun basking when they pulled up, looked around and I figured that a pickup truck was parked where they needed to be. You are supposed to keep your and your visitor’s vehicles on your site, but many sites are vacant so they become overflow parking. The man approached me wondering if I knew who owned the truck but I could only suggest he check at the office. Sounded French Canadian. The Quebec couple purchased the van/camper in Alaska; they are hard-core living in a tiny space. We smiled when the top popped up and later a heating/AC unit became visible. Then an awning came out with legs secured with stakes. 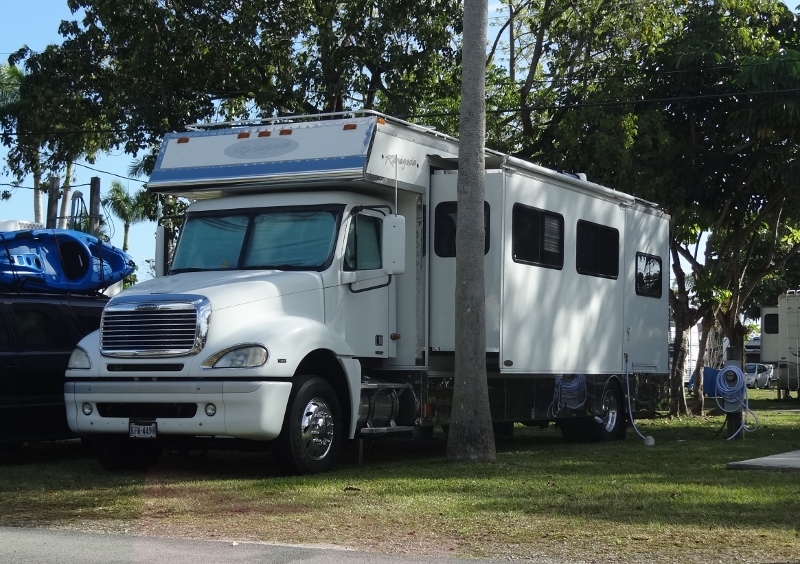 The gorgeous Harley is trailer towed along with several large containers of “stuff”. The tiny van grows up! The elevated pool is nice, the Tiki bar dark, the rec hall large with Wi-Fi available and a full bookcase along with games and puzzles to borrow or work on a table with a task lamp. Dumpsters fill up quickly even though the resort isn’t full. The laundry room is a busy place with inefficient dryers; loving my Splendide more each day. Route 1 Dixie Highway is one block away and you take your life in your hands driving it during rush hours or weekends. Found Jersey Boardwalk Pizza 3 miles north on Rte 1, big mistake for our first drive out on a Saturday night! One of the many Walgreens around is a mile away with a RedBox and we spent 30 mins getting the movie and the pizza. Wrong lanes, wrong turns and this was using Google map on the iPhone. Most shopping plazas have side entrances only or the way in is so convoluted you can’t be sure if you are in the right place or not. The only safe place to bike is in the resort; no bike paths on our road or even close by and cars zoom when they can. A calendar of events shows regular shuffleboard and horseshoe events, cards and games many evenings, bingo and special breakfasts and dinners a few times monthly. An Ok place, good enough for a two-week stay; we look forward to our upcoming Everglades stay and four county and state park visits through March 23.